Dr. Vinton Cerf, often touted as the "father of the Internet", spoke recently on the current status of the Interplanetary Internet (IPN). The IPN is a proposed method for linking together Earth and the ever-increasing number of space probes we have sent out. Put more simply, it is the means whereby Earth's nervous system expands outwards across the solar system - and beyond. Cerf spoke at the NCSA/ACCESS (National Computational Science Alliance/Alliance Center for Collaborative Education, Science and Software) located in Arlington, Virginia. His talk was a summation of the progress made thus far on the IPN by the Internet Research Task Force (IRTF) and the Interplanetary Internet Research Group (IPNRG) as well as a look ahead. Note: The charts presented by Dr. Cerf are online at SpaceRef. Cerf is well equipped to speak on the topic of developing complex computer networks. He is currently Senior Vice President for Internet Architecture and Technology at MCI Worldcom located in northern Virginia. His oft-cited "parentage" of the Internet emanates from the fact that he is the co-developer (with Robert Kahn) of TCP/IP (Transmission Control Protocol/Internet Protocol) - the collection of protocols proposed in 1974 upon which the Internet was created - and without which our dot com world would not exist. TCP/IP was proposed to address a number of network management issues (at the time mostly military) which included: the ability to route data between subnetworks, independence of subnetwork technology, independence of host computer hardware, independence of operating system, tolerance of any error routes in subnetworks, a robust ability to recover from failures, and the ability to add a new subnetwork and still keep functioning. The task facing Cerf and his team today is much more complex than just "wiring up" the solar system. On, or immediately above Earth, (or any other world), the current series of Internet protocols work fine when transit time (latency) of a signal over the Internet is small and there is an ability to have symmetry in bandwidth and speed to and from a location. Moreover, the components of the system can be easily enhanced and replaced. However, when you begin to consider networking between worlds, things get complex - fast. When you start to consider distances so vast that the speed of light becomes a constraint, bandwidth becomes a precious commodity, and locations are so remote that network components need to be ultra-reliable, autonomous, and power efficient for years at a time, the true scope of the task becomes evident. The IPN won't be able to duplicate all of the things we take for granted on Earth. Indeed, some things are precluded by both the laws of physics and of human nature. How many high-bandwidth vocal conversations do you expect people are going to have with someone on Mars when signal lags (each way) can be as long as half an hour? Letters (email) are more likely to find their way from one world another - once we finally decide to go to another world that is. From Cerf's presentation, you understand that this task is both daunting in its challenges and tantalizing in its potential. The Interplanetary Internet is being designed to be a network that connects a series of Internets. These internets would be located on planets and moons, or aboard spacecraft. The IPN will need to embody an inherent design that allows for long transmission times, bandwidth constraints, blockage, lost data, and constantly moving sources. Despite the limitations for the current intra-planetary Internet protocols for handling interplanetary network chores, there is a model currently developing within Earth's Internet that shares some characteristics with what the IPN will face. This is the so-called "untethered" (wireless) segment comprised of mobile phones, computers, pagers, satellites and other devices. Characteristics of this segment include signal delays, data errors, asymmetric channels, and disjointed connections (have you driven through a tunnel while on your cell phone lately?). The problems faced by rovers on Mars communicating with their local internet will be similar to those faced by commuters on Earth. In assembling the IPN, its developers are looking to use what is already in place. Indeed, current TCP/IP protocols will work fine on planets. It is the protocols that link internets between planets that need to be developed. These planetary internets will be linked to one another by Internet Gateways, which will be located at various locations across the solar system. The standards being adopted as a basis for the IPN are the result of work done by both the IETF (Internet Engineering Task Force) and the CCSDS (Consultative Committee for Space Data Systems). The protocols that underlie the IPN are going to need to share many of the capabilities that the Earth's Internet required (and are embodied in TCP/IP). This system is going to need to be rather robust. The IPN will need to be backward compatible with the systems that are already in place across the solar system. That is - once a gateway has been put in the Jovian system for example, the IPN needs to be able to interact with the gateway even if core IPN protocols have been upgraded. Internet protocols are constructed in a series of tiers or layers. The same will be true for the IPN - and each layer needs to be aware of the capabilities and constraints of those beneath and above. The IPN also needs to be scalable i.e. it needs to be able to grow to accommodate increased traffic to and from some locations (Earth and Mars for example) yet it needs to be cognizant of other portions (layers) of the system where communication will be spotty and "bandwidth-challenged (e.g. the outer solar system). It also needs to be able to handle extreme asymmetry in data transmission. The ability of an Earth-based radio dish and transmitter to send a signal is always going to vastly exceed the ability of a lander's small antenna and transmitter. The IPN needs to be able to handle both. The gateways and other physical components of the IPN distributed across the solar system (and beyond) need to be frugal with regards to their use of power. Cerf cited the cost of delivering 1 watt on a spacecraft in orbit around Mars at approximately US$200,000. The cost of delivering that same watt to a lander on the surface of Mars is US$75,000,000. Add in the fact that the solar flux on Mars is half that on Earth, and that the use of nuclear power sources is still somewhat forbidden, and it becomes clear that both power sources and power usage need to place a strong emphasis on efficiency and economy. The IPN also needs to be robust and able to work around failures - indeed, Cerf feels that it needs to embody an almost organic or self-organizing paradigm that allows the system to discover its connectivity, taking into account new nodes, users who have moved, or broken pathways. In assigning names and identities, the IPN needs to be able to parse routing so as to allow each planet's gateway to handle that planet's own traffic without having to be constantly updated about activities within all planetary internets. One novel, somewhat heretical concept mentioned by Cerf would depart from the current format where every piece of data has a name to one wherein the system sense the type of data being sent and handles that data accordingly. Within Earth's internet, data is given a name and identity, which it keeps from the moment of its departure until, arrives at its final destination. This works because the system has every right to expect very short transmission times and can handle constant back and forth queries along the way. Given the fact that the IPN will connect individual internets, and that near real time end-to-end connectivity is not possible, this name/data "binding" will not be practical when it comes to shipping things between planets. Communication can be expected to be spotty, slow, and dependent upon getting a series of connections or "hops" across the solar system. As such, the IPN will need to use to a "store and forward" approach to shipping data between gateways and around the solar system - one not at all dissimilar from the Pony Express system used to send mail across the American West in the 19th century. Indeed, these gateways will need to have "custody" of the data for varying periods until such time as it can be forwarded on to another gateway - with delays caused by bandwidth availability, celestial blocking, power availability, etc. This way, the successful delivery of data is not dependent on the veracity of complete path but rather of the incremental handoffs between rest stations along the way. Some of the low earth orbit constellations being constructed also use a store and forward approach. One of the core concerns in developing the IPN is security. Not only does the IPN need to be certain that information flows to/from the proper locations, it also needs to be resistant from an ever-present human scourge: hackers. This system is going to be a rather precious resource for some time to come - one that needs to be protected. Current Internet security protocols often require a series of "handshakes" wherein computers certify one another's identify and permissions with a series of back and forth messages before allowing data to be sent. Since two-way communications are somewhat impractical between planets - or at least time and resource consuming - different approaches will be needed to assure security. The Secure Sockets Layer (SSL) protocol currently used for financial transactions and some of the protocols used to secure email are possible paths to emulate in providing security for IPN routing of data. Another complex issue needs to be considered - the notion of time and location on an interplanetary scale. According to Cerf, the concept of "now" has to be discarded. The speed of light and the distances involved make it an archaic concept. The IPN needs to have some sort of synchronizing capability not unlike the timetables used to run a train system. Antennas need to know where something will be and when it will be there so as to be ready to send or receive a signal. They also need to take into account celestial mechanics and the fact that transit times change as things orbit the sun. There is also the annoying fact that the sun can block signals for weeks on end when two sources find themselves on opposite sides of the solar system. One way to ameliorate blockage and tracking problems is to take the geostationary satellite approach used for Earth's telecommunications satellite constellations and employ it on a larger scale. This can be done by placing satellites in orbits around regions of space (LaGrange points) wherein the sun's and a planet's gravitational forces are balanced out. The L4 and L5 locations tend to be the more stable places for such applications. The SOHO satellite is currently in such an orbit with respect to the Earth and the Sun. The L1, L2, and L3 locations require fuel expenditures for station keeping i.e. making sure the satellite doesn't drift. The fuel issue becomes rather important when you consider the great distances involved and the expected lifetime of a satellite. One approach being considered, according to Cerf, is the use of solar sails for station keeping. No fuel is required, just sunlight. The first component of the IPN, "Marsnet", is now being developed to facilitate the exploration of Mars. It will be comprised of several low orbiting satellites and perhaps a satellite in synchronous (areostationary) orbit. 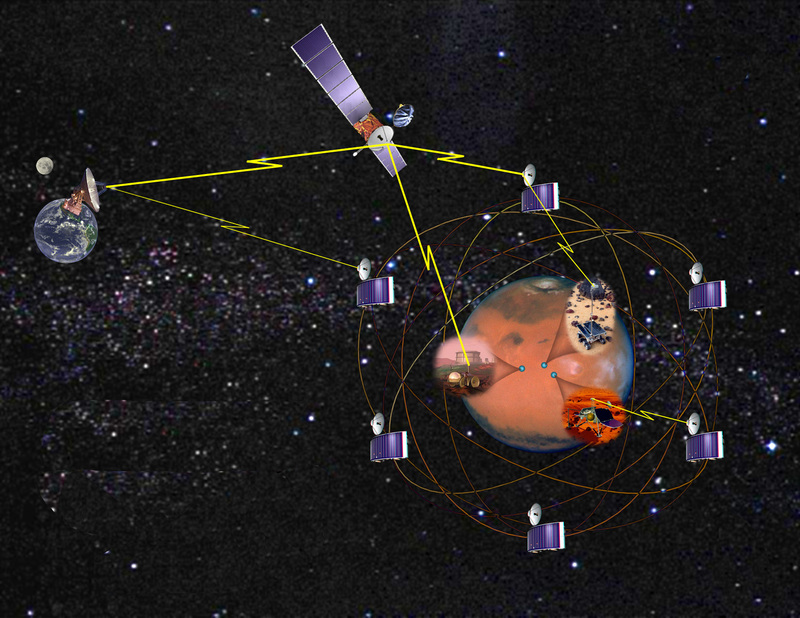 These satellites will coordinate with landers and sensors on Mars and with satellites in orbit. This should allow science missions to focus more of their limited weight, power, and volume allocations on science and less on data transmission, a chore to be assumed in great part by Marsnet. The problems that arise when such a system is not in place were made glaringly evident when the Mars Polar Lander (and the two DS-2 probes) vanished. The Mars Climate Orbiter, whose relay system the MPL was supposed to have used, had crashed months earlier. Only the Mars Global Surveyor and its relay capability remained. Moreover, the MPL had no way to signal its status as it made it's landing approach. Where these various gateways will be placed will be determined by the locations we chose to study. In addition to robots on Mars, Europa is one obvious location. So are the comets and asteroids, a permanent human presence in Earth orbit, on the moon, and Mars. One would hope that the next phase of solar system exploration will begin to include a planning mindset focused on going out there - to stay - and what sort of infrastructure will be needed. Up until now we've flung things out there more or less as one shot deals with no substantial thought devoted to what will come next - or how each mission can serve to support the next. Again, the Pony Express model, and the rest stops built along the mail routes, is an apt one to recall. One item Cerf openly admits not having grappled with is what to do with interstellar missions. This is something he prefers to let his successors worry about. Although our first interstellar probes are likely to move at a very small fraction of the speed of light, future probes would introduce yet another prickly issue into the design of IPN - how to handle relativistic effects and the fact that the rate at which components of an IPN perceive (measure) time are different. One of Cerf's closing thoughts placed the challenges and potential of the IPN into a historical context. As mariners began to expand outward across Earth's oceans in the 15th and 16th centuries, on the heels of Columbus and those who made the initial forays across the great oceans, so came the need for ever more accurate means of determining location. With this, the need for accurate timepieces to allow the calculation of longitude (hence eastward or westward location) became paramount. Eventually, in the late 17th and early 18th centuries, nations offered financial prizes to those who could develop portable clocks with enough accuracy to make accurate determinations of longitude possible. Within less than a century, we were dragging telegraph cables across our planet's seabeds. Now we find ourselves building upon the initial reconnoitering done by Voyagers, Pioneers, and Vikings. Time standards applicable to interplanetary travel are now required to let us find our way and then phone home with the news.